In the shadow of a cliff on an icy rock 700 million kilometers from Earth, a washing machine-sized robot by the name of Philae has spent the last two years in hibernation. We’d already given up hope of speaking with humanity’s first and only comet lander ever again, and time was running out to catch a final, fleeting glimpse of the beloved craft. In the eleventh hour, science prevailed. 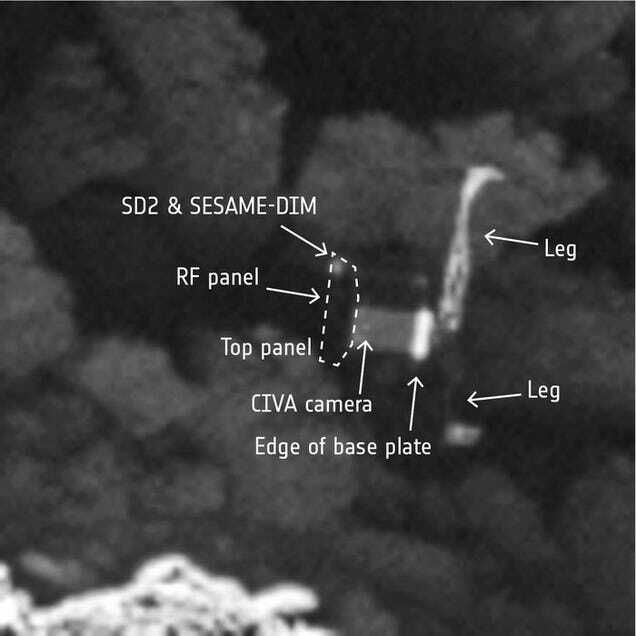 On Sunday, during its second-to-last pass over Philae’s likely resting spot on Comet 67P/Churyumov-Gerasimenko, the Rosetta spacecraft’s OSIRIS camera obtained visual confirmation of the robotic lander, wedged into a dark crevice beneath a craggy cliff. The fuzzy, oversaturated photo released Monday by the European Space Agency (ESA) is the triumphant culmination of a two-year search, which intensified this past summer as Rosetta spiraled toward Comet 67P in preparation for a controlled descent on September 30th. The search for Philae began almost immediately after the lander’sunexpectedly eventful touchdown on November 12th, 2014. The craft bounced several kilometers over the course of two hours before coming to rest in a rocky region. From photos taken by Philae in the vanishing hours before its batteries drained on November 15th, we knew that the lander had tumbled into the shadow of a cliff dubbed Perihelion. 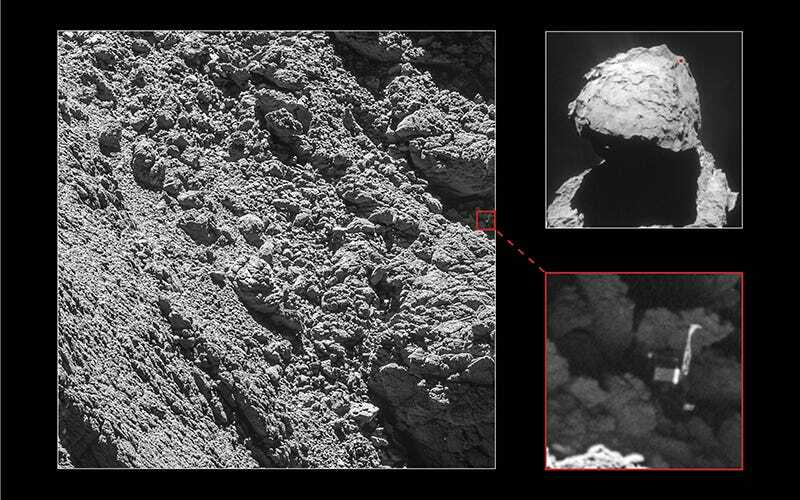 What wasn’t clear was whether Philae remained in its original spot beneath the cliff’s shadow, or if it had been blown elsewhere by a cometary outburst. Either way, finding the lander was going to be difficult, given that its most likely resting location received at most a few hours of sunlight per day. Nonetheless, a search commenced, with scientists pulling together troves of data—radio signals sent from Rosetta to Philae and back, images of the surface taken by the orbiter, and images taken by Philae itself—to hone in on the lander’s likely location. A promising elliptical area, named Abydos after the sacred city of ancient Egypt, was soon identified, but actually spotting a lander in Rosetta’s early flyby photos (taken 20 kilometers or more above the surface) proved nearly impossible. Eventually, O’Rourke’s team was able to narrow Abydos down to a region just a few tens of meters in diameter. 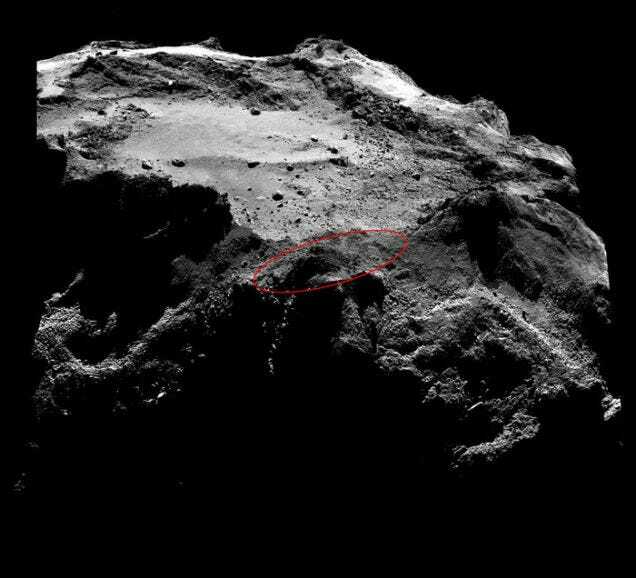 But it wasn’t until earlier this spring that Rosetta got close enough to acquire the hi-res images needed to clearly make out a meter-sized robot on the comet’s surface. “Distance was the key,” O’Rourke said. “We needed to be below 10 kilometers in order to start picking Philae out from the rocks,” particularly the ice-rich ones whose gleaming surfaces have similar optical properties to Philae’s solar panels. Throughout the spring and summer, Rosetta made a series of low-altitude swoops over Abydos, photographing the rugged terrain from different altitudes and illuminations during the course of its normal scientific operations. (Only once, after Philae buzzed the Earth in July 2015, was the spacecraft’s course deliberately altered to aid in the search for the missing lander.) All the while, the illumination grew dimmer as the sun migrated north of the comet, akin to the situation on Earth where winter days are shorter due to the sun being lower in the sky. In spite of the dying light, evidence was converging on a specific spot beneath the originally suspected site of Perihelion cliff. In addition to capturing several promising images between May and August, the team used 3D surface modeling and automated image searching to hone in on the lander’s precise whereabouts. They also succeeded, on several occasions, in matching Philae’s lost RF signal to the line of sight Rosetta was searching along. 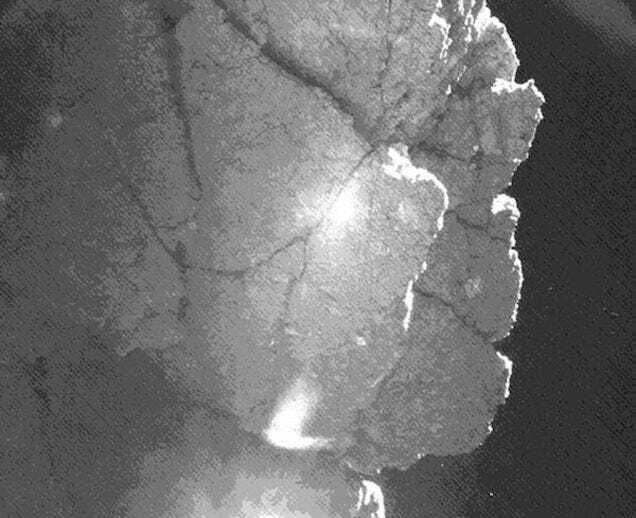 But the ironclad proof came in the form of the image captured on September 2nd, from a distance of just 2.7 kilometers when Philae was in Perihelion cliff’s shadow. Despite the poor illumination, image processing revealed several of Philae’s prominent features, including its meter-wide body and two of its three legs, extended. Several of the lander’s instruments were also identified. The discovery does more than offer the search team some well-deserved catharsis. “Besides the satisfaction and public impact of now having found [Philae] and knowing where it is, this breakthrough brings new data to the scientific aspects of the Philae mission,” ESA Rosetta mission manager Patrick Martin told Gizmodo. During its 57 hours of activity on the surface, Philae collected troves of data onComet 67P’s complex surface, in addition to giving us an unprecedented snapshot of the volatile gases and organic molecules present on such a body. Knowledge of Philae’s exact location at the time these measurements were made allows scientists to ground-truth these discoveries. Finally, Philae’s tumultuous landing, and the quest to rediscover it afterwards, has given scientists and engineers plenty of lessons to ponder when designing future missions. O’Rourke, for his part, has one modest request: that all future comet landers be equipped with emergency LEDs.